Red Egg prayer beads and necklaces are for sale. If you are interested please contact us or visit our Etsy shop. “The man in the middle seems to have some vision of what’s to come. 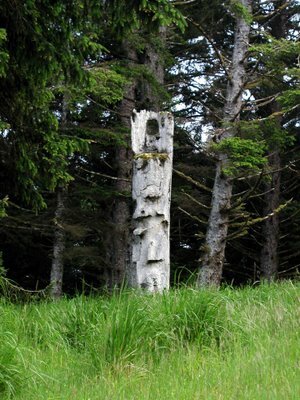 “Is the tall figure, who may or may not be the Spirit of Haida Gwaii, leading us – for we are all in the same boat – to a sheltered beach beyond the rim of the world, as he appears to be? 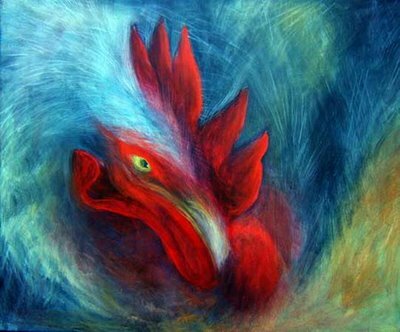 Or is he lost in a dream of his own dreamings? 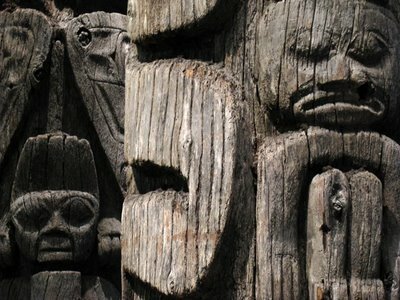 Tonight we went to the anthropology museum at the University of British Columbia in Vancouver. 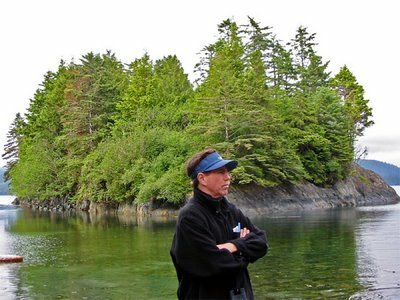 It brought back so much from our trip five years ago to Haida Gwaii. I just stared and stared at the old poles again, which had been saved from their decay on the islands and had been brought here to be conserved. About 7.30 pm we went outside to see the poles Bill Reid and others had carved much more recently. It was drizzling. And then soon the drizzle became proper rain. Thank God. 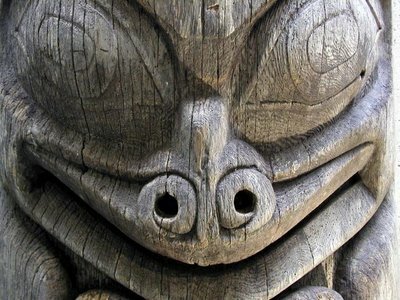 Now I had those poles (and Susan Point’s Musqueam house posts) to myself. Even Debi had gone inside. Even in the mist and rain, it wasn't Haida Gwaii -- but it was as close as I'll get this time. And I could feel the place again. I could really feel the place. It made me question everything -- or certainly it made me question museums. I know the old poles would be rotting on the shore now. I know someone had to save them. But I also know they weren’t made for a museum. When I went back into the museum myself, the place was nearly empty. And then it was empty. For twenty-five minutes, Debi and I (and one guard) had the place to ourselves. We had Reid's "Raven and the First Men" to ourselves. Then we went back to those old poles from Ttanuu and Qquuna and Sghan Gwaay. I whisked away everything in the rooms but them. All I wanted was to be drifting in a canoe past Shaman's Island into a misty cove again – praying and calling out to the watchmen for the necessary permissions. That's what these poles still do, even in a museum, if you can be alone with them enough. They point the way. I've always loved that quote by Hesse: "Our only guide is our homesickness." She makes them up. Either she makes up the whole damn thing – or else she just freely weaves her own story into them. Into these “saints,” that is. Into these corvid and chicken-icons. St. Abundance. St. Laya. St. Riel. And all the others. Some have “real” saints’ names, but she’s made up all or part of their hagiographies. There is an icon of her father, who built the Catholic church on the island, but with whom Elaine has argued about orthodoxy all her life. There’s an icon to pain, to a woman’s sexual pleasure, to the explosive forces within a marriage. Hearing this, you might think these icons are just irreverent – iconoclastic icons, as it were. After all, they do break every rule. But that never occurred to us when we were with them – because they come from such a sharp, intelligent questioning. They come from a woman who as a young girl felt such a profound spiritual awareness that pat catechism answers just left her more dissatisfied. And you’re reminded of how desperately you need this kind of humor -- in order to poke holes in all the damn hierarchies you’ve been so busy-as-a-bee building all around and within yourself. Back inside, Elaine’s studio was still full of delight and conversation and laughter. She has such energy about her. It bursts out everywhere: in her garden, in her conversation, in her art. We all need our local saints. 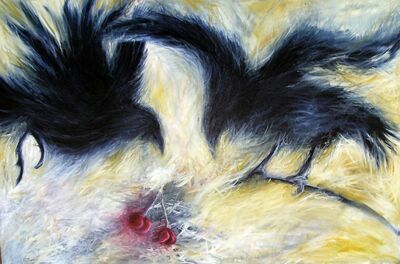 I must add that Elaine also does these fantastic acrylic paintings - mostly of corvids, fruit and poultry.